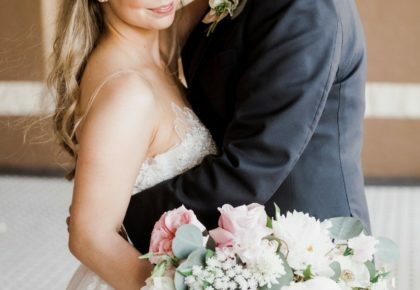 Taylor and Alex’s earthy Austin wedding is oh-so-dreamy with a touch of elegance and rustic charm that was perfectly captured by wedding photographer Anastasia Strate Photography. Check out this gorgeous gallery! Taylor and Alex went to high school together, but only got to know each other after reconnecting through Facebook years later. Because Alex was working in Africa, they spent a lot of time chatting on the phone. When he got back to Texas, he visited her and they have been inseparable since. For a special dinner with her parents, the group planned on dining at one of Taylor’s favorite spots – Gruene River Grill. After dinner and a quick bottle of wine, a nervous Alex got down on one knee in front of Taylor’s parents – and everyone else in the restaurant – and asked her to marry him! Taylor and Alex’s wedding day was a relaxing one. The bride shared a special moment with her fathers before the ceremony. When the church doors swung open and Taylor and Alex’s eyes met – they were overcome with joy. 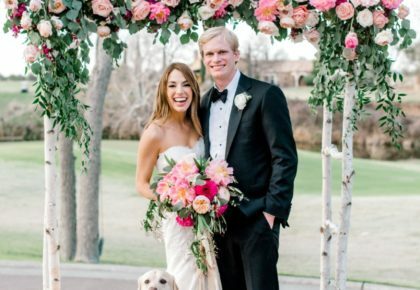 Following the blissful ceremony, the couple enjoyed mingling with family and friends, and lots of dancing.